Saul pursued the Philistines then learned David was in the Desert of En Gedi. Saul and 3000 men looked for David near the Crags of Wild Goats. Saul found a cave to use the bathroom in. David and his men were hiding in this cave. At the urging of his men, David cut a piece of cloth off Saul’s robe, but refused to kill him for he was the Lord’s anointed. Saul left the cave, and David revealed himself, bowing down before Saul. He said he could have killed him but did not. He is guilty of no wrong-doing, and may God be the judge between them. Saul, in tears, admitted David is more righteous than he and asked the Lord to reward him for sparing his life. He knows David will be king, and had DAvid swear not to cut off his descendants. Saul went home; David to his stronghold. David takes refuge in God’s mercy. God fulfills His purpose for him, saves him, and rebukes those who pursue him. God sends His love and faithfulness. David is in the midst of lions, God be exalted. David will praise God. Great is God’s love and faithfulness. David tells God his troubles. God guides him through them. God is David’s refuge from those who pursue him. The righteous (supporters, friends) gather around him because of God’s goodness. 13) David’s men assumed they knew God’s will. They assumed because Saul appeared before them — alone and vulnerable — that God was delivering Saul into David’s hands. We make assumptions all the time — probably more so than in ancient times. We assume what people mean, what people’s actions mean, and what God wants us to do, often not asking first. We do the same thing. 14) David said the Lord forbid him to do anything to his master, the Lord’s anointed, or lift a hand against him. Personal desire in David wanted to kill Saul and finally have his revenge. God’s desire stayed his hand. It is all about God for David and what God wants. 15) Personal Question. My answer: He invites me to do the right thing in every situation. How often do I do it? Unsure. Probably not often. Fighting against your inner desire when you know God’s desire is difficult. Overcoming human emotions is difficult. Every day I pray God wins a little bit more in these situations. 16) Part personal Question. My answer: David’s ultimate prayer is for God to be his refuge and guide him, and for God to rebuke his enemies. Still David praises and exalts the Lord in all his troubles. David is praying in faithfulness that God has it and will handle all his problems. So must we. We need to pray, knowing God has got it, knowing God will take care of all of our worries and heartaches. We still must praise and exalt him for His goodness despite our ignorance of what His will is. He is our refuge, our guiding light, and our hope. It struck me that Saul does not apologize for his actions. I sense no remorse for chasing David for years or disobeying God. It seems Saul has finally decided David will be king when he dies, so he’s happy to return home and live a kingly life. Very sad. David’s faith once again shines in all these passages. He knows God will deal with Saul His way. He knows God will rescue him. He knows God is faithful and good. David sings as much. Honoring God despite our hardships has to be forefront. A faithful heart is what God wants first; the rest will follow. In the previous chapter, God miraculously delivered David by drawing Saul away to fight the Philistines at the moment Saul was ready to capture David. But when Saul was done with the Philistines, he went back to pursuing David. We often wish that our next victory would be a permanent victory. We wish that the spiritual enemies who pursue us like Saul pursued David would simply give up, and we wouldn’t have to bother with them any more. But even when we have victory and they are sent away, they come back, and will keep coming back until we go to glory with the LORD. That is the only permanent victory we will find. The En Gedi canyon runs westward from the Dead Sea. One can still see the good-sized creek flowing down the canyon, making En Gedi, with its waterfalls and vegetation seem more like a tropical paradise than the middle of the desert. One can also see the numerous caves dotting the hills. This was a great place for David and his men to hide out. In the middle of barren desert, scouts could easily detect approaching troops. There was plenty of water and wildlife and many caves and defensive positions. The sheepfolds: This indicates that this was a large cave, big enough to shelter a flock of sheep. All or most of David’s 600 men could hide in the recesses of the cave. Saul went in to attend to his needs: Since the Bible is a real book, dealing with real people living real lives, we aren’t surprised to see it describe Saul’s attention to his personal needs. But something as basic and common as this was timed and arranged by God without Saul having any knowledge of God’s timing or arrangement of things. The fact that Saul went in to attend to his needs also meant that he went into the cave alone. His soldiers and bodyguards were out of the cave waiting for him. Coincidence Saul chose David’s cave? What are the chances? 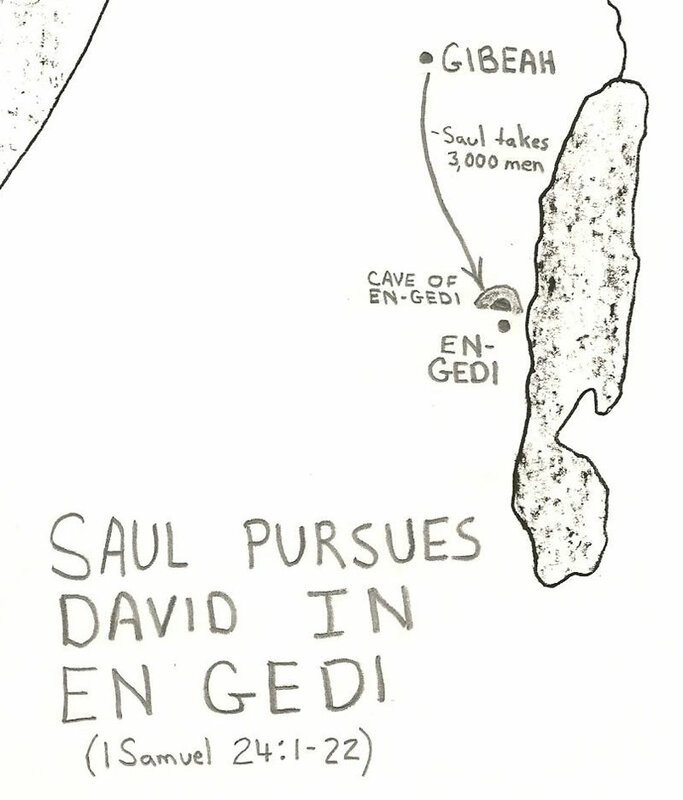 Saul must attend to his personal needs at the very moment he passes by the very cave where David hides. This was no coincidence but arranged by God to test David, to train David, and display David’s godly heart. David’s men were excited at the opportunity and believed it was a gift from God. They knew it was no coincidence that Saul came alone into that cave at that moment. They thought this was an opportunity from God to kill Saul. Apparently, on some previous occasion God promised David, “Behold, I will deliver your enemy into your hand, that you may do to him as it seems good to you.” They believed that this was the fulfillment of the promise and that David needed to seize the promise by faith and by the sword. We can imagine David listening to this counsel from his men and with his sword creeping quickly towards Saul, covered by the darkness of the cave. David’s men are excited; their lives as fugitives are about to end, and they will soon be installed as friends and associates of the new King of Israel. But as David came close to Saul and put forth his sword he didn’t bring it crashing down on Saul’s neck or thrust it through his back. Instead he secretly cut off a corner of Saul’s robe. How did David sneak up on Saul unbeknownst? Saul may have laid his robe down in one part of the cave, and attended to his needs in another part, so David did not have to get right next to Saul to cut off a corner of his robe. There was enough noise and commotion from the thousands of men outside of the cave along with their horses that David was simply undetectable. Why did David spare Saul? David knew Saul was in the way of that promise. David knew it was God’s job to take care of Saul not David’s. David wanted the promise to be fulfilled but he refused to try and fulfill God’s promise through his own disobedience. Sometimes when we have a promise from God we think we are justified in sinning to pursue that promise. This is always wrong. God will fulfill His promises, but He will do it His way, and do it righteously. Instead, we need to be like Abraham, who obeyed God even when it seemed to be at the expense of God’s promise, willing to sacrifice the son of promise (Genesis 22). Even more, we need to be like Jesus, who didn’t take Satan’s offer to “win back the world” at the expense of obedience (Luke 4:5-8). “We wait on the Lord by prayer and supplication, looking for the indication of his will; we wait for the Lord by patience and submission, looking for the interposition of his hand.” (Meyer) David was determined that when he sat on the throne of Israel it wouldn’t be because he got Saul out of the way but because God got Saul out of the way. He wanted God’s fingerprints on that work, not his own, and he wanted the clean conscience that comes from knowing it was God’s work. We also see that David’s heart didn’t store up bitterness and anger towards Saul. Even as Saul made David’s life completely miserable, David kept taking it to the Lord, and he received the cleansing from the hurt, the bitterness, and the anger that the Lord can give. If David stored up bitterness and anger towards Saul, he probably wouldn’t have been able to resist the temptation to kill him at what seemed to be a “risk free” opportunity. Why did David feel guilty for cutting Saul’s robe? The robe was a symbol of Saul’s royal authority, and David felt bad – rightly so, according to the heart of God – that he had done anything against Saul’s God appointed authority. In that day, a man looked ridiculous with his clothes cut short. In 2 Samuel 10:4-5, cutting a garment was a deliberate insult that led to war. David wouldn’t allow his men to kill Saul either, thereby taking the responsibility off his hands directly. Why did David reveal himself to Saul? David cares for Saul and wants to reconcile with him. Saul could have killed David when David bowed before him. David believed God would keep him safe as he did right before God. David covers Saul’s sin and is careful not to blame Saul directly. David shows mercy and kindness to Saul. David will fulfill Proverbs 10:12: Love covers all sins, and 1 Peter 4:8: Love will cover a multitude of sins. It is entirely wrong for people to use the idea of touch not the Lord’s anointed to insulate a leader from all evaluation or accountability. We can criticize and confront our pastors when they sin. What does the tearing of Saul’s robe symbolize? In 1 Samuel 15:27-28 the prophet Samuel rebuked Saul for his hard-hearted disobedience to God. In his distress, Saul tried to keep Samuel from leaving, and grabbed his robe, and a portion of the prophet’s robe tore away. When Saul was left holding the torn piece of Samuel’s robe, Samuel said to him: The LORD has torn the kingdom of Israel from you today, and has given it to a neighbor of yours, who is better than you. Now, when David confronts Saul with the torn robe, Saul must be reminded of this incident, and God’s message to him was loud and clear. It was God’s business to take Saul’s throne and no one else’s. Jesus established the same principle in Matthew 18:7 when He said, offenses must come, but woe to that man by whom the offense comes! God’s judgment is God’s business. We put ourselves in a bad place when we make ourselves instruments of God’s judgment. David’s obedience to God and his love to Saul made all the difference in softening Saul’s heart. Saul wanted the same kind of promise from David that he made to Jonathan in 1 Samuel 20:13-16. In that day, when one royal house replaced another it was common for the new royal house to kill all the potential rulers from the old royal house. Saul knew that one day David and his descendants would rule over Israel, and he wants David to promise that David and his descendants will not kill or mistreat the descendants of Saul. David let Jonathan’s son Mephibosheth live (2 Samuel 9) in part because of his promise to Jonathan and Saul. David stays away from Saul because he is unconvinced Saul’s heart is changed permanently. This is another Michtam, or Golden Psalm. The cave was probably Adullam cave, mentioned in 1 Samuel 22:1, though the caves of En Gedi (1 Samuel 24:1) are also a possibility. Adullam seems to be the best fit; therefore we can say that Psalm 34 is also associated with this period of David’s life. David repeats the request of mercy twice. When he fled from Saul into the cave, he had been through several near-death terrors (see Psalm 56). David came to Adullam cave (1 Samuel 22) alone, discouraged, and in continued danger. He needs mercy right now, and God is his only hope. Using a familiar image of a mother bird shielding her young from danger that we’ve seen before, David expressed his trust and hope in God for defense. FUN FACT: This figure of speech is also used in three other Psalms (Psalms 17:8, 36:7, and 63:7). Jesus used this same word picture to show his love and desired care for Jerusalem (Matthew 23:37). David came to the cave alone, and God was his only help. Yet he was confident, knowing as a military man the strategic value of high ground in battle. 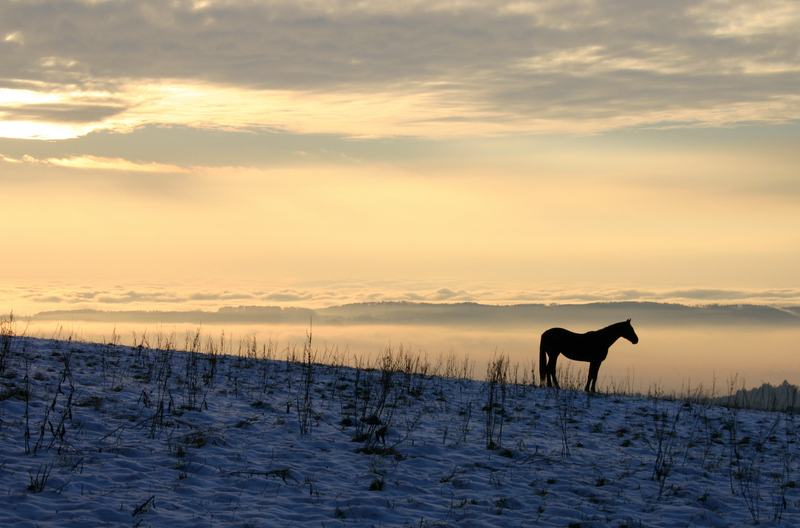 He looked to help from the Most High who occupied the greatest high ground of all: heaven. There may have been lions prowling around David’s shelter. What did David know that we often forget? David knew all his problems came from earth; he would glorify God above the earth. The pit prepared by enemies has instead trapped themselves who dug it. The Psalm began with David twice appealing for mercy; now David twice expressed his steadfast confidence in God and sang. The Psaltery [lute] was a stringed instrument, usually with twelve strings, and played with the fingers. The harp or lyre was a stringed instrument, usually consisting of ten strings. A cave narrows and darkens the vision of most people, but David’s heart and song exalted the mercy and truth of God even from the darkness. A cave was a long way from the throne of Israel God had promised David. David didn’t wait for his circumstances to change before he praised God. He knew they would change, and he thanks God ahead of time for it. Verse 11 repeats verse 5 because of its goodness and for emphasis (“Be exalted, O God”). 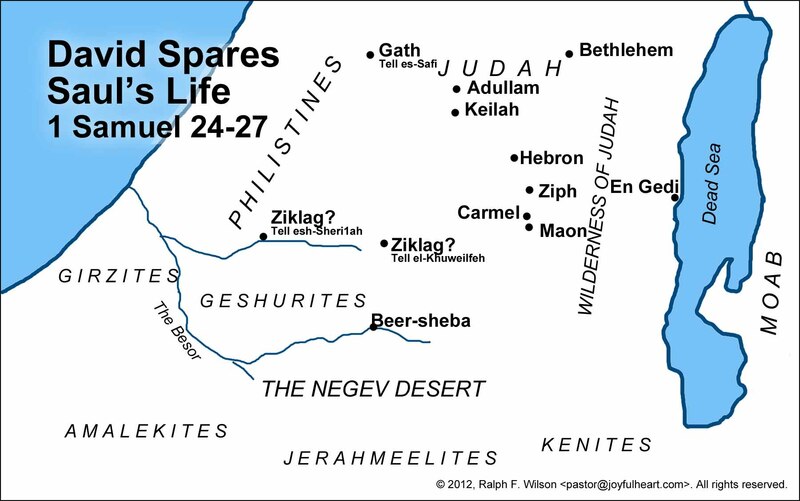 The cave was probably Adullam cave, mentioned in 1 Samuel 22:1, though the caves of En Gedi (1 Samuel 24:1) are also a possibility. Adullam seems to be the best fit; therefore we can say that Psalms 34 and 57 are also associated with this period of David’s life. Verse 1 is David’s declaration of allegiance to Yahweh, the God of Israel. Is it wrong to “complain” to God? David asks God’s help in the face of enemies who hoped to trap him, so this complaint is likely against his enemies. David did the right thing with his complaint; he brought it before the LORD. David had the heart later expressed by the Apostle Paul in Philippians 4:6: Be anxious for nothing, but in everything by prayer and supplication, with thanksgiving, let your requests be made known to God. Anytime David felt overwhelmed, he found confidence in knowing that God knew his journey and his walk. God knows our path and our walk in all of its good and all of its bad. God could preserve him from secret snares. David knew that even if he were forsaken by men, God had not forsaken him. He had the confidence that God Himself was his portion, his inheritance. The ‘right’ signifies the place where one’s witness or legal council stood. Among men, David had no refuge (Psalm 142:4). David could confidently proclaim that God was indeed his refuge. The cities of refuge were for the protection of an Israelite in special circumstances, and David found his place of refuge not in a place or in a particular circumstance, but in the Lord Himself. David once again brought his cry to the Lord, this time honestly confessing his low circumstances. David didn’t feel a need to pretend that everything was fine or that he wasn’t weak; he could come to God for help even when brought very low by persecutors who were stronger than David. They are stronger than I: This means that David well understood his present weakness. The one who killed Goliath felt himself to be very weak, which was a good place for David to be. God’s strength would soon flood his life. David began the song with complaint (Psalm 142:2); he closes confident of praise to come. David began the song with a great sense of isolation (Psalm 142:4); he closes with confidence in soon companionship and support from the righteous. David began with the sense of being low and weak (Psalm 142:6); he closes confident in God’s future goodness, knowing that God would deal bountifully with him. I love your site and posts but I need to apologize because I cannot read long posts. I will try my best. Thank you for the follow.